An All Women’s Run, a dream for many lady runners out there is now finally happening! Women’s Health Philippines and Athena collaborated to stage their first-ever ALL WOMEN’S RUN on March 19, 5AM at the SM Mall of Asia grounds. I was invited by Summit to attend the blogger’s night last Monday. I’ve always look forward to attending events by Summit. Aside from seeing most of by blogger-running friends there, I get to enjoy the humor of their host. The Men’s Helath Urbanathlon 2010 blogger’s night was one of the most enjoyable blogger’s conferences I have attended. I’m a huge fan of wit and a girl big on funny. And they did not disappoint that night. Christine Ongteco, Team Publisher for Summit, hosted the event and I was happy to have met her. A year ago, I read that she together with Lara Palparan and another friend joined the relay edition of IronMan 70.3. She did the swim part. What struck me most about her was that she practically didn’t know how to swim and trained only a few months before the event. OMG! And yet, even with minimal training, she clocked in after an hour for a 1.9km swim. I was thinking, if she can do it, then there is still hope for me. The whole team even landed a podium finish. WOW! What an inspiration. After I read the article, I seriously considered registering for the next CamSur Half IronMan relay. Unfortunately, my work schedule did not permit me to do so. Boooo! Maybe next year? 1. It’s an All Women’s Run. No boys, no spitting boys, no sweaty boys, no stinky boys, no boys peeing at the side of the road…. Oh wait, I was pertaining to my 4 boys ;p For those of you who live at home as the only girl, you will appreciate this event. 3. 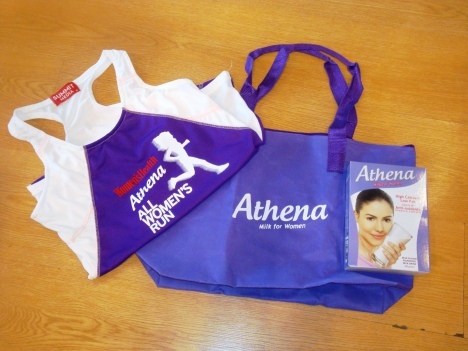 Instead of a typical Manila envelop being used to store the kit or a plastic bag for the post-race goodies, you will be given a Women’s Health race bag. What will you do with this bag? Bring it with you to the event! You will need it when you collect freebies and goodies from sponsors like PhCare, Celeteque, MyraE, Goody, BananaBoat, Playtex, Century and many more. 4. Finisher’s bracelet. Instead of a finisher’s medal, a finisher’s charm bracelet will be given to 5k and 10k finishers. How kikay! 5. Racer-back singlet. This is another reason why you should join, the singlet is an absolute delight to look at! Remember girls: You will need to be wearing this when you cross the finish line in order to qualify for the finisher’s bracelet. 6. And to top it off, the race director is Coach Rio dela Cruz. This means that safety, hydration and an excellent route will be waiting for us. That means the use of D-Tag technology to accurately measure your finish time. Open exclusively for women ages 16 years old and above. Girls below 16 may still register, as long as they are accompanied by a registered female adult running in the same category. Late registration period is fromMarch 1 – 15, 2011 at the following venues: Toby’s SM Mall of Asia and RUNNR, Bonifacio High Street.